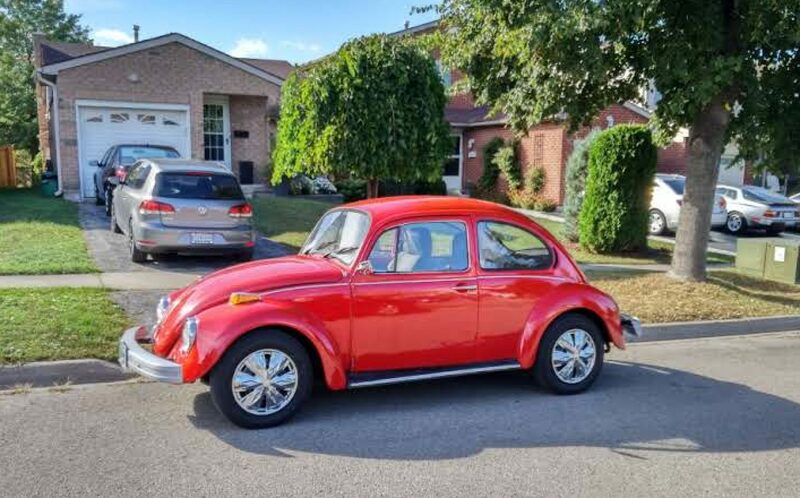 In the ’66 beetle I own, the 6 volt battery sits on the metal floor pan under the rear seat, passenger side. Since I have owned the car (1971) I have performed a bi-annual maintenance on this area. The following describes the procedure. Before you start this procedure, consider also, servicing the battery itself (i.e. internal fluid levels), cleaning the battery terminals and also the contact area of the ground strap where it attaches to the VW’s metal body. You might as well service the battery while you have it disconnected and out of the car. The point of this procedure is to neutralize the acid that has escaped from the inside of the battery onto the external surfaces of the battery and onto the metal floor immediately beneath the battery. If left unattended, the acid will eat through the black floor paint and begin to corrode the metal. Battery acid is a strong acid and will eventually corrode entirely through the floor pan. This is something you do not want. Yes, the battery has caps to prevent the acid from easily escaping but acid does escape. It escapes through the vent caps as a result of road vibration, overcharging, extreme temperature fluctuations on really hot days and rough handling of the battery. 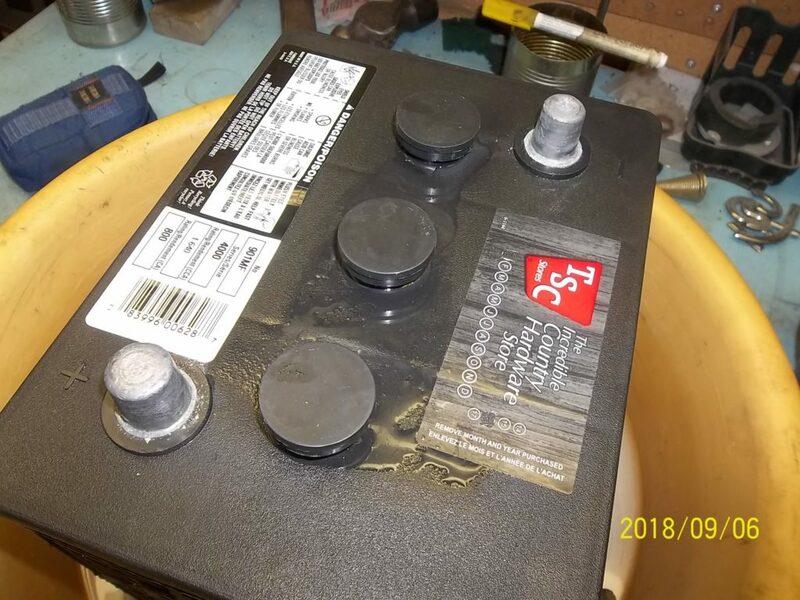 I remove the battery entirely from the car and place it in a plastic tub. Then I mix up a solution of Baking Soda and warm water. I carefully pour the solution into the tub to a depth of about 1.5 inches. Then carefully, I take a paper towel, wet it in the solution and wipe the sides and top of the battery completely. While wiping the top of the battery I am very careful to not wet the positive and negative terminal posts or put so much fluid on the top surface of the battery that the terminal posts are connected through the pool of liquid lying on the battery surface. 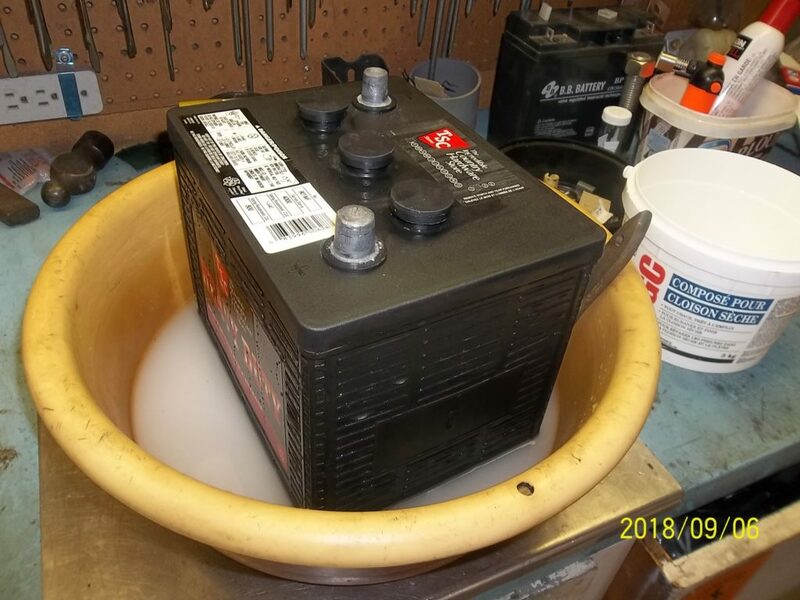 Once the entire battery has been wet towel washed I remove it from the tub and place on cardboard or newspaper so that the bottom of the battery becomes dry. I also dry the top and sides of the battery. Make sure the battery is entirely dry before returning it to the car. Before installing the completely dry and clean battery, I take some fresh solution and go to the car with it. Now I carefully wash the metal floor with the solution. Don’t be stingy with the solution. Use the solution liberally as you will dry the floor once the washing has finished. Make sure the metal floor upon which the battery sits is completely dry before installing the battery. The chemistry behind this procedure is simple. From your high school days you will recall that an acid (pH less than 7) can be neutralized by a base (pH greater than 7). When an acid is mixed with a base, Co2 gas is formed. This Co2 gas can easily be seen during our procedure as many small bubbles arising in our solution. In fact, this is how we know when there is no more acid left to be neutralized, the bubbling stops. Before attempting this job, there are some precautions one must consider. The battery is really heavy. Be ready for the weight. Wear rubber gloves while handling the pre-washed battery as it will have acid on it and this residual acid could burn your skin. Rubber gloves are slippery when wet so be careful lifting the battery if the rubber gloves are wet. To dispose of the used Baking Soda solution, pour it down the sink with a good flush of water. To do a complete job, wire brush the area under the battery after it has been cleaned and neutralized in order to remove any surface rust. Then remove all the rust dust in preparation for painting. Apply a high quality undercoat, followed by a good quality metal paint. Follow the instructions of the paint manufacturer regarding dry time between coats. 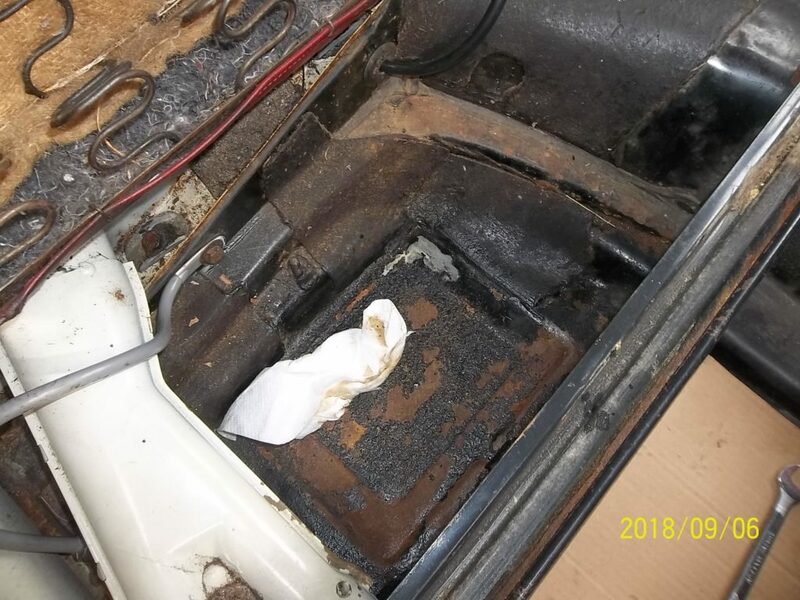 It is very common for older VW cars to have severely corroded and perforated metal in the area immediately under the battery. By performing this bi-annual service, this won’t be an issue for your car. Once the first few holes develop, more holes develop more quickly as water and road grime now have an entry point to the interior of the car. K-W and Area Bug Club.